After several weeks of waiting for a reply from the Servas hosts, Z and I decided to go ahead and try to extend our hotel stay. I looked up. All of the passengers from the middle of the plane over were bent towards the windows. Sighs eased from their mouths. An orange ray shone on their faces and up onto the cabin ceiling. I leaned over too, but I couldn’t see a thing. We walked out of customs, looking. Men leaned against the railing, some clean-shaven, some in beards, some wearing the same small cylindrical hat Z said Sri Lankan Muslims wore after making a pilgrimage. They held signs with names, clipboards and tour company posters. I’ve always wondered who these signs were for, who would be meeting someone they didn’t know, what the meeting would be like. We looked for our names. And then looked some more. Then we looked at each other. There was no one here for us. “What do we do now?” I asked, just to say the words. And so we waited. I watched the women. One, in a track suit, leaned over the currency exchange counter, petit, but rounded. She had the figure of my best friend. Another, young, her head covered in black, ran into the arms of an older woman, smiling so widely I had to smile too. She put the woman’s hand to her forehead, and then kissed it, before falling into her with a hug. She was a large woman, but soft. Good, I imagined, for a hug. Many others wore scarves over their heads, silk flowers folded into a triangle, and tied under the chin. With this: long winter coats that came to their ankles. Children holding their fingers. Their cheeks ruddy, their eyes kind and black. I looked over again. One woman took a small child from her shoulder and handed it to a man with the same eyes, and lashes. The woman next to her took two corners of the child’s blanket. The mother took two others. The man placed the child inside, and walked away. The women swung the blanket and the child back and forth, laughing. His cries ceased. I turned Z to show him. When I turned back a man with a sign was rushing past. 5 Oda it said. And then it said my name. “Besh oda?” The man asked. And I learned my first word in Turkish. Besh, rhymes with mesh. Five. 5 Oda. We drove along the Bosporus, black and glinting, in Friday night traffic, passing, with busses, under what I’d call ruins. We stopped and started. In the distance the minarets glowed, tall yellow spires. 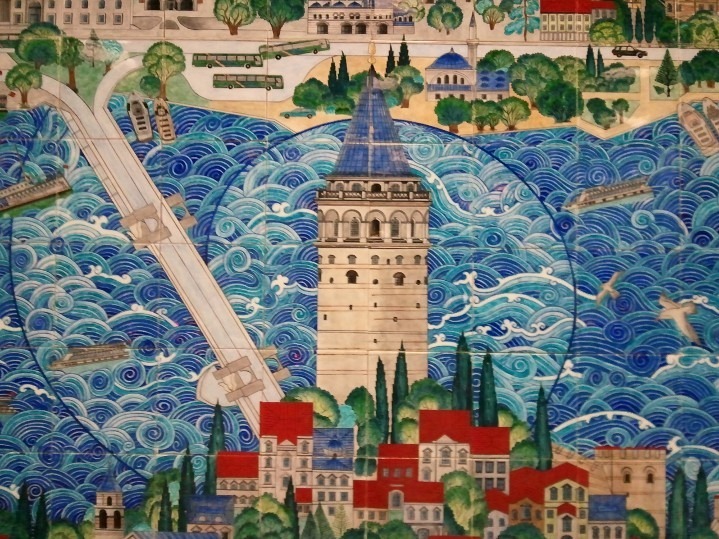 “Four is Suleymaniye, 6 is Blue Mosque,” the driver said. I leaned over Z to look. They looked like tall thin, supermodel rockets. The driver turned into a narrow road, with small shops lighting it from either side. People pulsed down the sidewalk. The car rumbled over cobblestone. The driver made another turn, as if into darkness, and stopped. “Here?” I asked. I am always amazed that ‘here’ can be anywhere. And that when you don’t know where you are you can arrive without even knowing it. “Besh Oda?” The driver said turning around, tired, with a hint of exhaustion and doubt. “Yes,” Z said, “Besh Oda.” The driver sighed. “Tesh…” Z closed the door. “What did you say?” I asked him. “Teshekur ederim,” Z said, very slowly. “Tech…” I tried again. Z shook his head again. We walked through a small homey kitchen and right into an elevator. “We’ll see,” said the young man who met us, “which is faster, technology, or legs.” He patted his legs as he said this, in case, I imagined, he had gotten the word wrong. As the elevator door closed I could hear the metal stairs ring under his weight. Z smiled that “we’re here” smile and the doors opened again. The man was waiting for us on the small platform. Behind him a ship in night lights floated down the Bosporus. “As I thought,” he said, “Legs!” and smiled. He wore a slight mohawk, an earing and a cashmere sweater. He showed us all the light switches and extra pillows and then unfolded a map on the dining table. It might as well have been his home. “Ah,” he said, and I thought how that sound, to me, belongs to a much older man. He looked up, we nodded, he picked up his pen. He smiled, and closed the door. The stairs rung as he descended. 5 Oda was great. You’ll hear more about it soon, but it is definitely recommended.